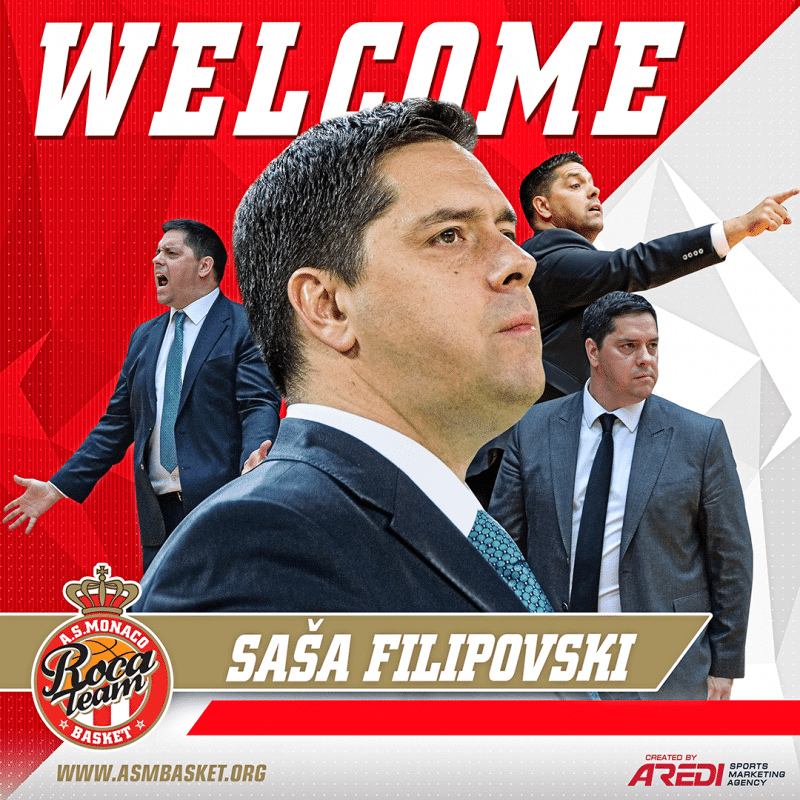 43-year-old Sasa Filipovski came to Monaco from Turkey, where he coached Banvit Bandirma. Two years ago, the Slovenian coach reached the Champions League final (after defeating the ASM in the semifinal). Last year, however, he lost in the quarterfinals against the same Monegasque team. Recognized Turkish League coach Sasa Filipovski won the Turkish Cup in 2017. Last season, with a very young team and the 12th championship budget, Filipovski reached the semifinals of the play-offs, before being beaten by the future champion: the Fenerbahce. Before his Turkish adventure, the Slovenian coach was two-time champion of Poland with Zielona Gora (2015, 2016) and two-time champion of Slovenia (2004, 2005) during his debut as head coach, with Olimpija Ljubljana. At that time, Filipovski had even managed to reach the Top 16 during his first season in the Euroleague (with the lowest budget of the competition). The Slovenian coach has signed with the ASM for two years and speaks French and English. The Roca Team also recently welcomed their first summer rookie, American Derek Needham. Born and trained in the United States, he also holds a Montenegrin passport and plays in the national team. This leader has been evolving in Europe for several years, with Lithuania, Germany, Italy and Montenegro. In Monaco, he will complete his position with DJ Copper, who will be with Monaco for another year, as will Gerald Robinson, Elmedin Kikanovic, Yakuba Ouattara, Paul Lacombe, Georgi Joseph and Captain Amara Sy, who recently extended his contract with the princely club. Regarding the preseason program, the Roca Boys will travel to Bormio (Italy) from the 5th of August for a preparation course. They will then participate in a tournament in Olbia, Italy (from 8 to 9 September), before heading to Antalya (Turkey) from 12 to 16 September. At the end of the courses and preseason tournaments, the Roca Team will have their first big shock of the season when they play their first match (22 September) against ASVEL, who are now coached by the Roca’s own former coach, Zvezdan Mitrovic! Note that the two finalists of last season (Le Mans and Monaco) will play on 24 November in Antares and again at Gaston Médecin on 23 March 2019. In the Eurocup, the Roca Team is in Group A with Red Star Belgrade (Serbia), Galatasaray Istanbul (Turkey), Leonessa Brescia (Italy), Ratiopharm Ülm (Germany) and Morabanc Andorra (Spain). The first day of the regular season for the Monegasques will begin on Wednesday 3 October in Brescia. They will then receive the Red Star Belgrade on 10 October for the first European match. Finally, the All Star Game will be held at the AccorHotels Arena on 29 December. The Disneyland Paris Leaders Cup LNB, meanwhile, will be held from 15 to 17 February 2019.